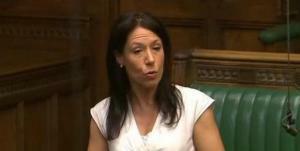 Oldham MP Debbie Abrahams has sensationally accused the Government of contributing to the deaths of vulnerable people due to sanctioning benefit claims in order to improve figures. The Oldham East and Saddleworth constituent publicly lambasted the secretary of state for work and pensions, Iain Duncan Smith, at a Department of Work and Pensions (DWP) Select Committee yesterday. The verbal exchange erupted after Debbie had questioned the minister about the huge number of people who leave Job Seeker’s Allowance and simply disappear from records after being sanctioned in order to boost the UK’s employment data. Mrs Abraham said: “Hundreds of thousands of people have had their benefits stopped for a minimum of four weeks and then approximately a quarter of these people, from the research that I’ve seen, are disappearing. Recent research from the University of Oxford suggests that more than 500,000 Job Seekers Allowance claimants have ‘disappeared’ since the sanctions regime was toughened in October 2012. This could mean the claimant count – one of the ways of measuring unemployment – is actually 20,000 to 30,000 higher each month than government figures. This suggests that in August 2014, the claimant count could have hit one million instead of being at 970,000. Since the government’s regulations came into effect in October 2012 about half of all sanction decisions have led to people on JSA having their social security payments cut for at least 4 weeks, affecting over 2 million people. After the session Mrs Abraham said: “It’s incredible that the minister can simply brush aside the mounting evidence that inappropriate use of social security sanctions is having on vulnerable people. “We’ve already heard from a whistleblower who left his job as a JCP advisor because he refused to apply sanctions when people had done nothing wrong. “And recently, over 200,000 people have signed a petition to look into the death of an ex-soldier and diabetic, from Stevenage, who died after having been sanctioned. “He was found dead surrounded by job applications, penniless and with an empty stomach according to his post mortem. He couldn’t even afford to run his fridge so couldn’t keep his medicines cold.